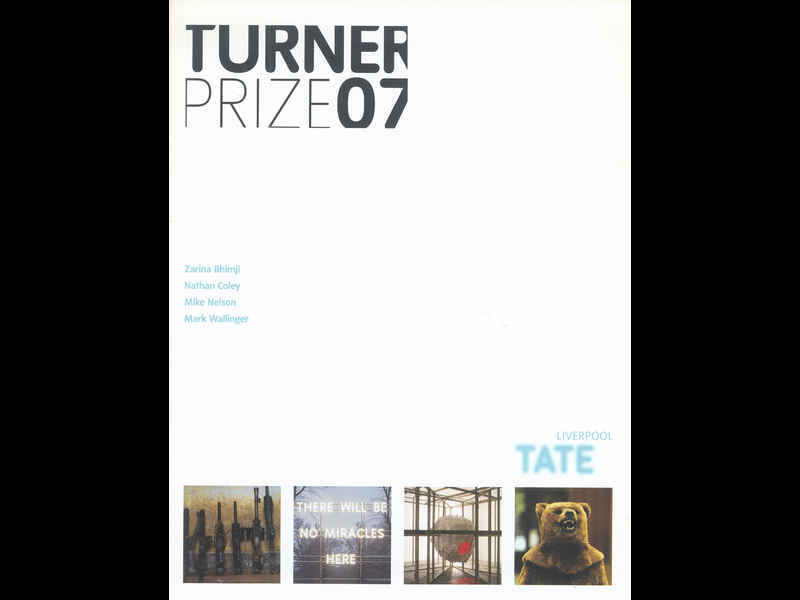 Catalogue (soft cover catalogue/monochrome text on white gloss paper with full colour illustrations/unpaginated) for the Turner Prize exhibition of 2007, held at Tate Liverpool, 19 October 2007 - 13 January 2008. Along with Zarina Bhimji, Nathan Coley, and Mike Nelson, Mark Wallinger was shortlisted for the Turner Prize 2007. The jury consisted of Christoph Grunenberg, Director, Tate Liverpool, and Chairman of the Jury, Michael Bracewell, Writer and Critic, Fiona Bradley, Director Fruitmarket Gallery, Thelma Golden, Director and Chief Curator, Studio Museum in Harlem, and Miranda Sawyer, Writer and broadcaster. The award was, in due course, made to Wallinger. The Turner Prize exhibition of 2007, held at Tate Liverpool, 19 October 2007 - 13 January 2008 showcased work by Zarina Bhimji, Nathan Coley, Mike Nelson, and Mark Wallinger. The jury consisted of Christoph Grunenberg, Director, Tate Liverpool, and Chairman of the Jury, Michael Bracewell, Writer and Critic, Fiona Bradley, Director Fruitmarket Gallery, Thelma Golden, Director and Chief Curator, Studio Museum in Harlem, and Miranda Sawyer, Writer and broadcaster. The award was, in due course, made to Wallinger.